The story of UB40, and how this group of young friends from Birmingham transcended their working-class origins to become the world’s most successful reggae band is not the stuff of fairytales as might be imagined. The group’s led a charmed life in many respects it’s true, but it’s been a long haul since the days they’d meet up in the bars and clubs around Moseley, and some of them had to scrape by on less than £8 a week unemployment benefit. The choice was simple if you’d left school early. You could either work in one of the local factories, like Robin Campbell did, or scuffle along aimlessly whilst waiting for something else to happen. By the summer of 1978, something else did happen, and the nucleus of UB40 began rehearsing in a local basement. Robin’s younger brother Ali, Earl Falconer, Brian Travers and James Brown all knew each other from Moseley School of Art, whilst Norman Hassan had been a friend of Ali’s since school. Initially, they thought of themselves as a "jazz-dub-reggae" band, but by the time Robin was persuaded to join and they’d recruited Michael Virtue and Astro – who’d learnt his craft with Birmingham sound-system Duke Alloy – the group had already aligned themselves to left-wing political ideals and forged their own identity, separate from the many punk and Two Tone outfits around at that time. The group had nailed their colours to the mast by naming themselves after an unemployment benefit form. Their political convictions hadn’t been gleaned second hand either, but cemented in place whilst attending marches protesting against the National Front, or rallies organised by Rock Against Racism. By the time Chrissie Hynde invited them to tour with the Pretenders during the summer of 1980 and their debut single "King b/w Food For Thought" had sailed into the UK Top 5, all the essential elements of UB40 were already in place. Their line-up will remain unchanged for almost thirty years, and they will continue playing a mix of original material and inspired choice of reggae covers in a style that’s instantly accessible with its bright melodies and sweeping horn arrangements – one that’s allied to a formidable rhythm section, capable of holding its own with anything from Jamaica. 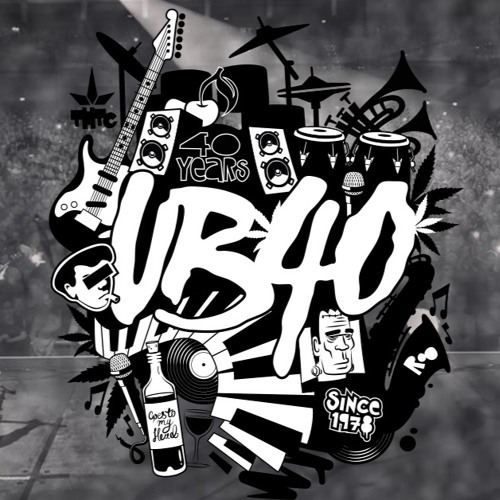 UB40’s first album was released the following September, on Graduate Records. Their deal allowed them more creative freedom than if they had signed with a major label. The cover artwork memorably duplicated an unemployment benefit card, with the title "Signing Off" rubber-stamped in red, but it was the music that quickly worked its way into the affections of a young, mainly student crowd with its knowing lyrics, solid reggae rhythms and dubby, instrumental passages, offset by warm horn solos and Jamaican style scatting. There was nothing else like it at the time. As a multi-cultural band from Birmingham, UB40 weren’t drawn into trying to sound "authentic," and there was considerably more depth to their music than that of many punk and 2Tone bands. "I’m a British subject, not proud of it, whilst I carry the burden of shame," they sang on one of the tracks. Accepting the truth of their own situation amidst a sea of other reggae songs proclaiming black heritage gave us a valuable insight into where UB40 were coming from. They were unafraid to stand up and be counted, and British audiences instinctively loved them for it. "Signing Off" duly went to No. 2 in the UK and stayed on the nation’s album charts for 72 weeks. On September 2nd, 2013, UB40 released their latest album ‘Getting Over The Storm’ on Universal/Virgin Records.